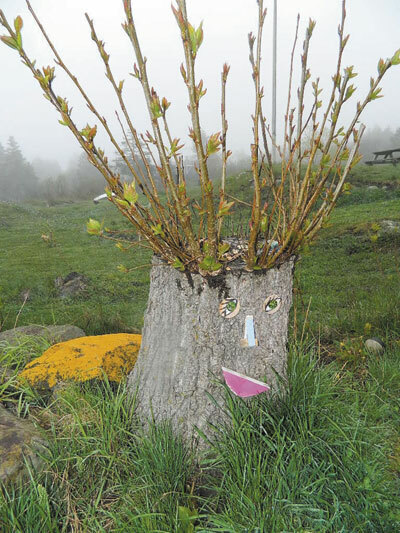 It’s easy to see why Monhegan Island has attracted so many artists. The island is a series of stunning visual impressions. And when we visited, colorful birds were everywhere, too! Thick fog covers a nearby island and flows in waves over the lawn. Eider ducks and herring gulls bob in the ocean. A gorgeous red cardinal sits and calls from a spruce tree. Free-range chickens stroll through the yard. A flock of yellow-rumped warblers settles into an apple tree. These are my impressions when I open the drapes of our first-floor room at Shining Sails Bed & Breakfast on Saturday morning. If we were any closer to the ocean, we’d have to be in a boat. And that’s another impression I got of the island — almost everyone has a stunning ocean view. The island is barely a square mile and most of it is undeveloped. Homes and cottages are centered in the village and spread out like wings from there along the rocky shore, facing westward, perhaps for those beautiful sunsets. Walking trails wind their way through people’s yards and then take you through the woods and across the island to a stunning vista of a rocky shoreline with crashing waves. John and Winnie Murdock, owners of the B&B, are very busy people. 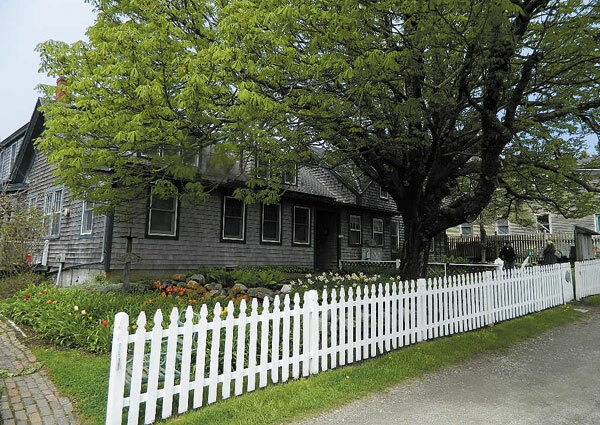 They also own an apartment building and serve as the rental agents for more than 30 cottages. We checked some of those out and discovered one that we’ll be renting sometime in the future. Situated right on the ledge above the ocean, if has a large deck, three bedrooms, large living room and nice kitchen, and it’s located at the end of a trail (many of the cottages do not provide drive-up access). We lingered there in the deck chairs and imagined a sunny summer afternoon. Our room at the B&B was very comfortable, included a full kitchen and opened to an outside deck overlooking the water. All of the other guests at this time of year seemed to be there, as we were, to birdwatch. 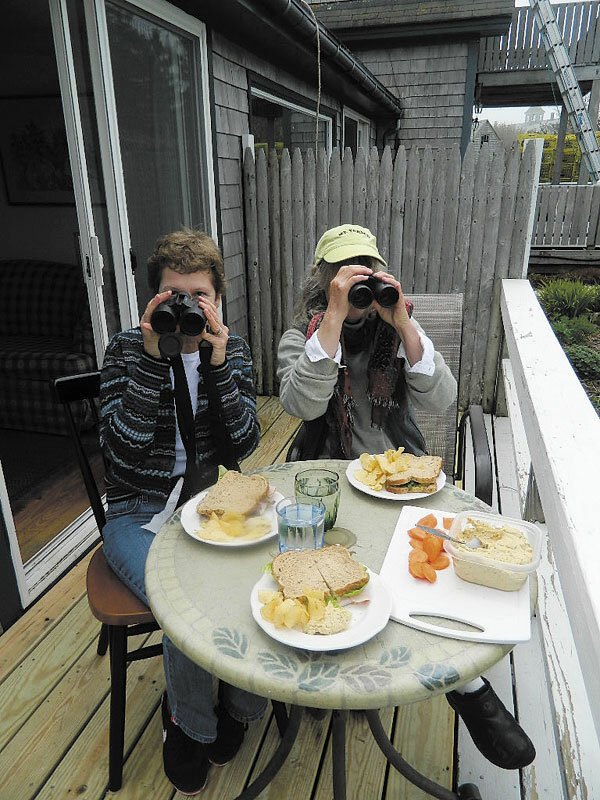 Our friend and neighbor, and the person who introduced us to birdwatching, Dona Seegers, joined us for this adventure. Although the island is a very busy place in the summer and a major destination for tourists, we were there “off season” before most places are open and when prices are lower. So Linda and Dona prepared our meals, often enjoying them outside on the deck. John and Winnie did provide breakfasts in a wonderful gathering room, where a morning fire drew me in. And we discovered that the island market, Carina, was open a few hours a day, making us wish we’d planned to purchase our produce and have lunch there. Next time! 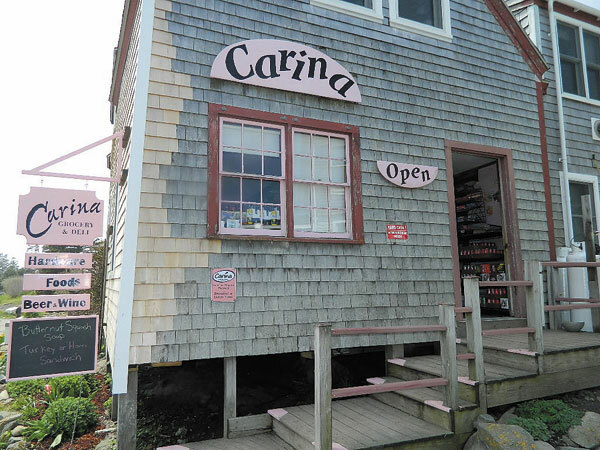 Many of the trips are aboard the historic Laura B., a beautiful wooden Army T-boat built in 1943 to serve as a wartime troop carrier and has been making the run to Monhegan for more than 50 years. Andrew and Amy Barstow took over the business from Andy’s dad, Jim Barstow, three years ago and will complete restoration of the Laura B. just in time for you to come aboard to see puffins, lighthouses and other coastal attractions this summer. Prices for these trips are very reasonable. The puffin/nature cruise that runs from June 10- Aug. 31 is only $30 for adults and $10 for children. What an adventure for your kids or grandkids! Monhegan Island is magical. A one-hour ride on the mailboat will transport you to a peaceful place that has spectacular scenery. While we visited, the weather was changeable but we found it enchanting no matter what. The sun popped out one afternoon and it was beautiful. A low fog hung in the morning and it, too, was beautiful. I really enjoyed the luxury of being able to stay overnight. This gave us plenty of time during the weekend to get up early to go birdwatching, and also to hike a trail that was new for all of us. It had striking water views and led to an amazing crop of bleached out dead trees in a marshy area. It is hard to describe the beauty of that spot. I will tell you that when George, Dona and I go birding, we get obsessive! We were scouring the island for many hours each day. We discovered a few trails that led to hot spots for birds, lending great views of warblers, orioles and a variety of other birds. We will now know where to go when we revisit each year. I know of no other place where the birds are perching so low and on a feeding frenzy. I guess you can ignore bird-watchers if you have just flown hundreds or thousands of miles and are starving! Though the forecast was for thunderstorms, the sun broke through after a morning of unbelievable bird watching. We were hoping to meet up with the Audubon bird-watching group, but they canceled their day-trip due to the weather forecast. We had no trouble finding over 50 species on our own. Our room at the Shining Sails included a kitchen where we cooked our meals, a sitting area, a quilt-adorned bed and a bathroom. The accommodations were not fancy, but were comfortable and perfect for us. There was no changing of linens, no hair dryer or air conditioning, nor did we need amenities. It was interesting to get home to see a news article about how expensive electricity is on the island. The owners were extremely hospitable. They provided a continental breakfast of juice, coffee, bagels, fruit and freshly baked muffins, and visited with us around the table. Our deck looked out onto the back yard where birds darted in and out. Beyond that, was a spectacular view of the ocean. The rocks at the ocean’s edge were filled with seagulls and cormorants and were easily visible from our cozy room. What more could you ask for? 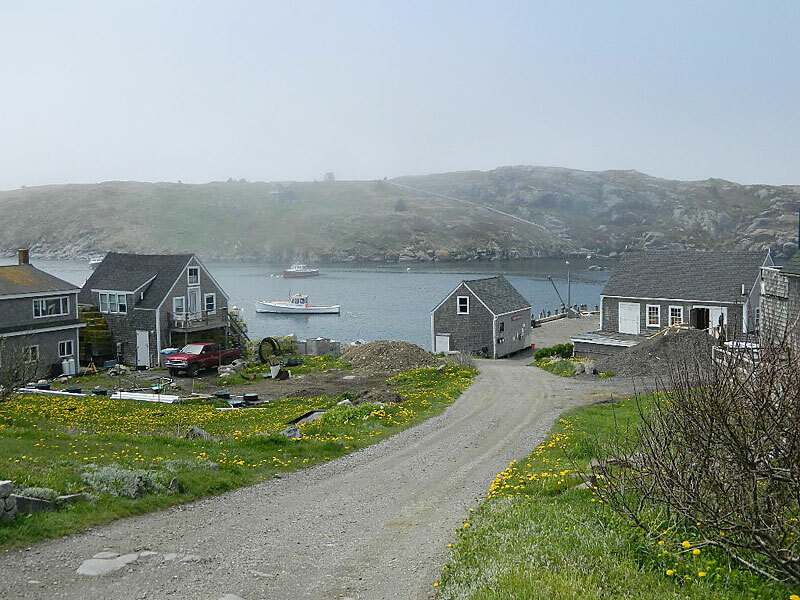 As an artist, gardener and birder my pleasure included Monhegan’s visual textures, fog-softened vistas, seaweed-mulched tulips and migrating songbirds. The fog heightened the vibrant colors and enriched the softer ones. I so enjoyed the off-season solitude as we birded our way through the weekend, discovering and revisiting the birding hot spots while taking in the gardens, architecture and relaxed atmosphere. Shining Sails was perfect for us, a comfortable accommodation, centrally located for the avid birder. Visit George’s website: www.georgesmithmaine.com for travel tips, book reviews, outdoor news and more.